In the January issue of PME, Toby O’Brien (Digital and Creative Services Director) discusses the responsibility we have to ensure digital adds value to medical education initiatives. The focus should not be on how much digital is packed into a medical education programme, but on how much value is added to the programme by doing things digitally. Toby explains that sometimes people assume that just because something is digital, it is innovative. 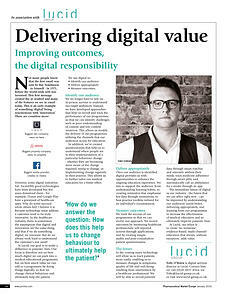 He argues that for digital to be truly innovative, it must address a need. It is therefore imperative that we work hard to understand our customer’s needs before deciding if digital will add value.